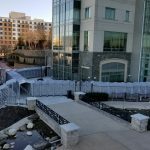 Phase II completed: Gaylord National Hotel gets more Commute-A-Walk® - Welcome to EAST ISLAND AVIATION SERVICES, Inc. 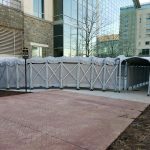 The Marriott Gaylord National Hotel chose Commute-A-Walk® as the portable pedestrian system to solve their problem. 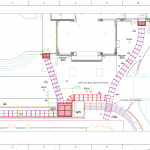 Working with their architects, we developed a five section walkway system that inter-connects the hotel and the kitchen to the ballroom with a section to accommodate ADA and physically impaired guests. When the walkway is not needed it is transported to a storage area via custom trailers provided by East Island Aviation. 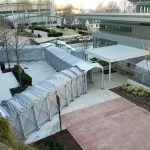 In 2018 East Island Aviation installed the second phase of portable walkways sections and fixed canopies to create this unique solution. 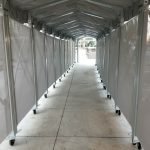 And even though the canopies that connect the walkways are static most of the time, we have designed them to also be removable id required. 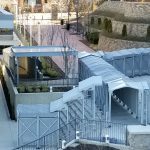 For more information on pedestrian enclosures, retractable walkways and other crowd-control devices contact Jim Larson at [email protected]. 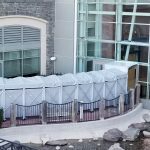 This entry was posted in News and tagged commute-a-walk, gaylord national hotel, pedestrian enclosures, portable walkways, retractable walkways on August 13, 2018 by Jim Larson.